1C:Enterprise is an easy-to-use and powerful platform for creating applications that streamline automation of a wide range of business processes. Check out this video on how easy it is to create a business application using 1C:Enterprise, a flexible rapid application development platform. In addition, you can test drive the business application developed based on 1C:Enterprise. This is an online demo version, which you can run and use through your web browser. Run online demo. To get started with developing your own application, let's prepare your computer and a development environment. You need to download and install free 1C:Enterprise platform (training version). Once you've installed the 1C:Enterprise Platform, you will be able to run it locally and start developing new applications or begin customizing existing ones. Note that a 1C:Enterprise application is logically divided into two major components that are closely interrelated: an application and the platform (1C:Enterprise) on which the application runs. The 1C:Enterprise platform is a Windows or Linux application, which contains everything you need to develop, debug, and run any application based on the platform. You do not have to install a DBMS because the training version includes a built-in proprietary database. At the same time MS SQL, PostgreSQL, IBM DB2 and Oracle database management systems are supported. Run 1C:Enterprise (double-click the 1C:Enterprise shortcut). In the 1C:Enterprise Setup dialog box, click Add. In the Add infobase/group dialog box, click Create an infobase and then click Next. Click the lowest option button Create an infobase without configuration... and then click Next. Specify a name for your infobase (any one you like) and then click Next. Click Next until you complete the wizard. The 1C:Enterprise platform (training version) package also includes the document Hello, 1C - Building your first application that you can use for your study and as a guide to create a first application on 1C:Enterprise. Hello, 1C is a simple application like "Hello, world! ", which will help you to gain a quick first impression of 1C:Enterprise and learn some of the basics of the development environment. To get support of 1C:Enterprise support team and 1C:Developer Network community, feel free to ask your questions at Studying 1C:Enterprise platform forum, which is intended to help beginners to understand 1C:Enterprise platform basics. Advanced users can use 1C:Enterprise – Business applications platform for more complicated questions. 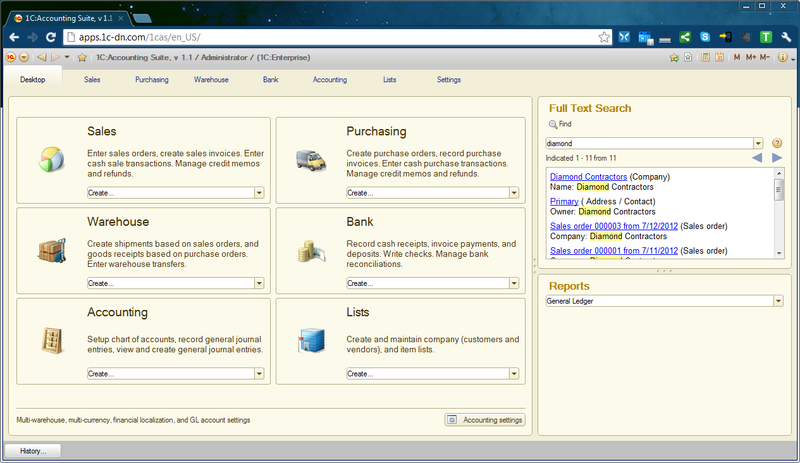 1C:Accounting Suite online demo that allows you to try 1C:Enterprise UI. Methodology section contains standards and best practices for 1C:Enterprise developers.